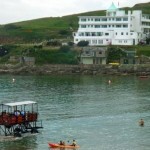 A great traditional family beach with Victorian Pier incorporating amusements. In addition there’s an impressive childrens playpark, skate park and green next to the beach. With beachside cafe and town closeby this makes for a great day out even on the dullest of days. 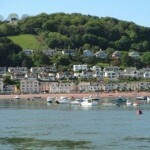 Although just across the river from Teignmouth, Shaldon offers a much smaller, more intimate beach with a pretty array of local shops, cafes, pubs and restaurants giving a bohemian feel. 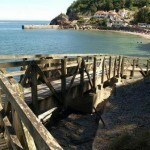 In addition to this estuary beach, Shaldon also offers Ness Cove, a much loved secluded and picturesque beach. 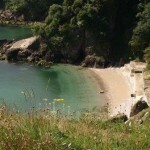 To get to Ness Cove you have to walk through the original Smugglers tunnel which makes this cove all the more special. 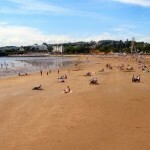 This long sandy beach is the main beach in Torquay and is very popular. 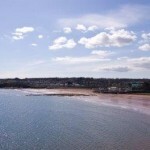 One end is called Torre Abbey Sands and the other, with the beach huts, Corbyn Head Beach. 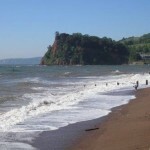 A great beach, with Torre Abbey Meadow behind and Rock Walk, Princess Gardens and Pier a short stroll away – as a result it can get quite crowded. Much of my adolescence was spent here and I have fond memories of walking up and down the beach selling ice creams and lollies from a cool box. An idyllic small shingle beach away from the crowds nestled between high cliffs and a thickly wooded hillside with plenty of trails to explore. Although quiet and peaceful there is a small cafe and shop. This beach is a popular spot with locals, walkers, climbers and coasteerers. 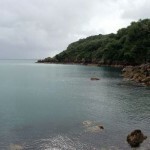 An unspoilt sandy cove popular for fishing and watersports. This beach has probably the most chic of beach bars, a gastro-Inn called the Cary Arms. It also has an adorable Seal that has made it his home with whom the regular anglers are happy to share their catch. A long sandy beach with a large green behind and a Pier incorporating amusements. On the other side of the green you’ll find a large variety of bars. 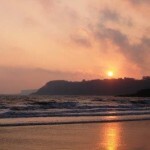 A large beach with lots of amenities and activities as well as the Quaywest Water Park. A great beach day for all ages. My sisters, school friends and I spent most of our childhood summers playing on this beach – it seemed so varied and wonderful, at the time we didn’t realise how lucky we were. It remains a firm favourite amongst the family. 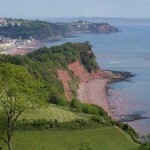 Broadsands is a large curved sandy beach that lies between Paignton and Brixham. There’s a promenade with colourful beach huts and best of all, a scenic coastal walk that will take you to a couple of secluded coves on the other side of the headland. Bigbury on Sea is well worth visiting if you don’t mind a longer drive. When the tides out you can walk across the sands to Burgh Island but the kids prefer it when the tides in and they get to ride the Sea Tractor across. 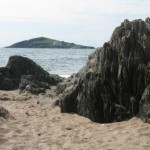 Burgh Island offers not only a nice walk around the island but also the Pilchard Inn, a 14th century hideout for smugglers. The most notorious Elizabethan smuggler Tom Crocker was shot outside the Pilchard Inn. 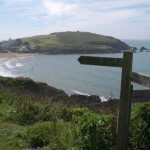 Burgh Island was also the setting for Agatha Christie’s novel “Evil under the sun”.